Thanks for the information on the VLB. I have several beautiful viburnums in my yard and would hate to lose them. Of course they are arrowwoods – the species most affected. What can one do to get rid of them? • Inspect viburnums in the winter for visual signs of egg laying. 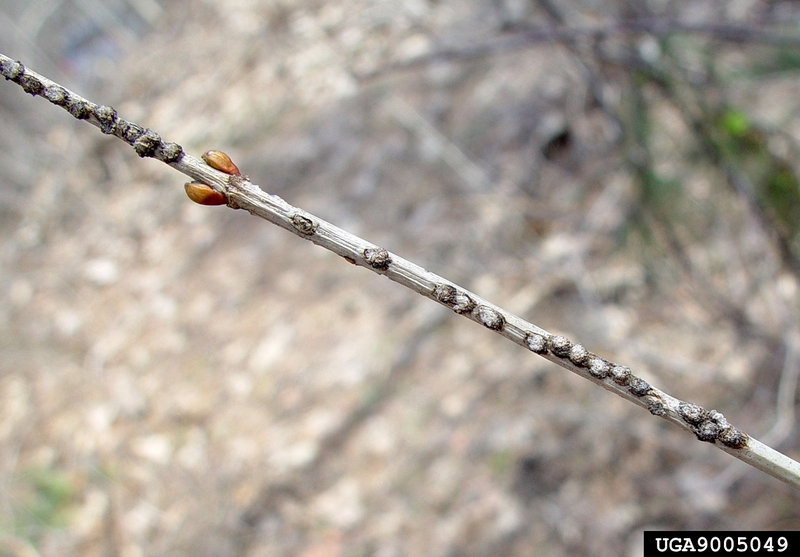 Look for off-color bumps on smaller twigs all in a straight line. • Inspect viburnums for larva just after leaf-out. 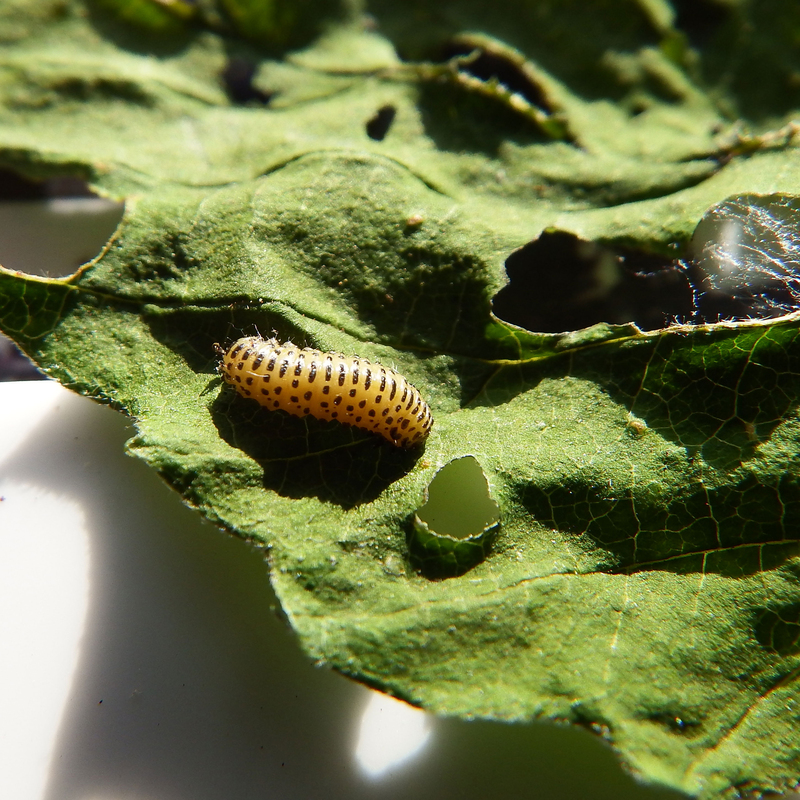 Look for very small larva on the underside of leaves. • Inspect throughout the season for signs of feeding damage and defoliation. • Plant resistant viburnum types. • Tolerance – Low levels of VLB are not very damaging. Remember that high levels, along with defoliation, can kill a viburnum if it happens year after year. • Prune out branches in the winter that are found with egg laying evidence. • Encourage or release natural enemies, such as ladybugs and lacewings that will feed on the young larva. • Pick them off by hand. Only practical if you have a small number of shrubs. • Knock off adult beetles into a container of soapy water. When a branch is disturbed the beetles react by falling off, so hold a bucket of soapy water under the branch and then gently shake it. • Spray the young larva very early on with an insecticidal soap (follow label directions carefully). Don’t expect 100% control with a soap spray. • Spray the young larva very early on with a pyrethrin (follow label directions carefully). • Spray a synthetic insecticide when larva is beginning to feed and cause damage (follow label directions carefully). Insecticide spray treatments for adults are not recommended for management. • Avoid using systemic neonicotinoid product as they may affect the pollinators, such as bees. So what are we supposed to do??!!! Hi, Joani! 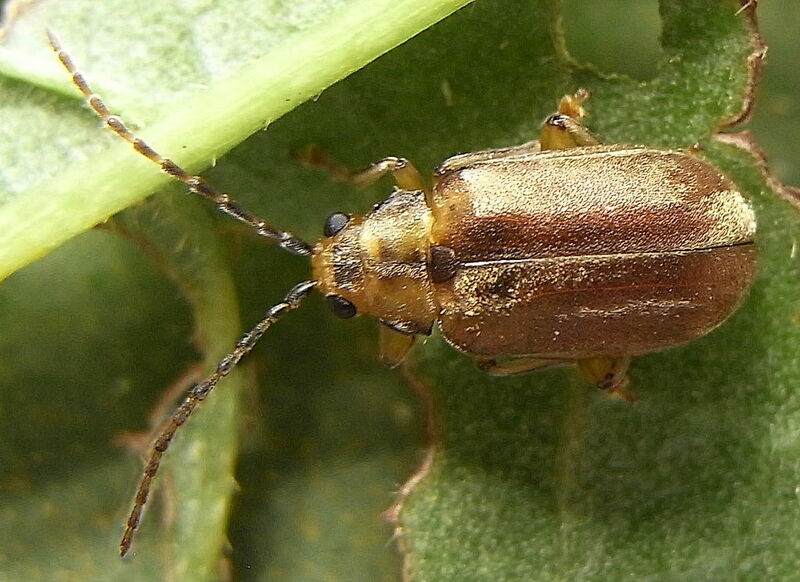 See my reply above to Russ for options on managing the viburnum leaf beetle. Thanks! Tom, don’t think this is new this year. I am in northeast Deerfield and began to see defoliation and damage to my viburnums last fall! Couldn’t find any answers to what was attacking them until I read the Trib article. This could be massive…. My viburnums started being defoliated 3 years ago. They now no longer produce leaves. I live in Lemont. Probably the beetle travels slowly through the area. I started reading about the issue around the time that my viburnums started having problems. By the way, I had about 5 or 6 varieties of viburnum. All of them were affected, perhaps because they were all in the shade. Any idea what’s attacking knock-out roses? First holes, then severe leaf browning. HELP! This is a great question for our Plant Information Service. Can you email it to plantinfo@chicagobotanic.org? They will surely help. Best of luck with your roses! I read this article at the right time. I wanted to plant Viburnum shrubs in my garden and was researching about it. I am glad that I came across this article. And is it true that they can grow in any soil type? I live in Hales Corners , Wisconsin and just noticed holes in my Arrowwood Viburnum leaves. 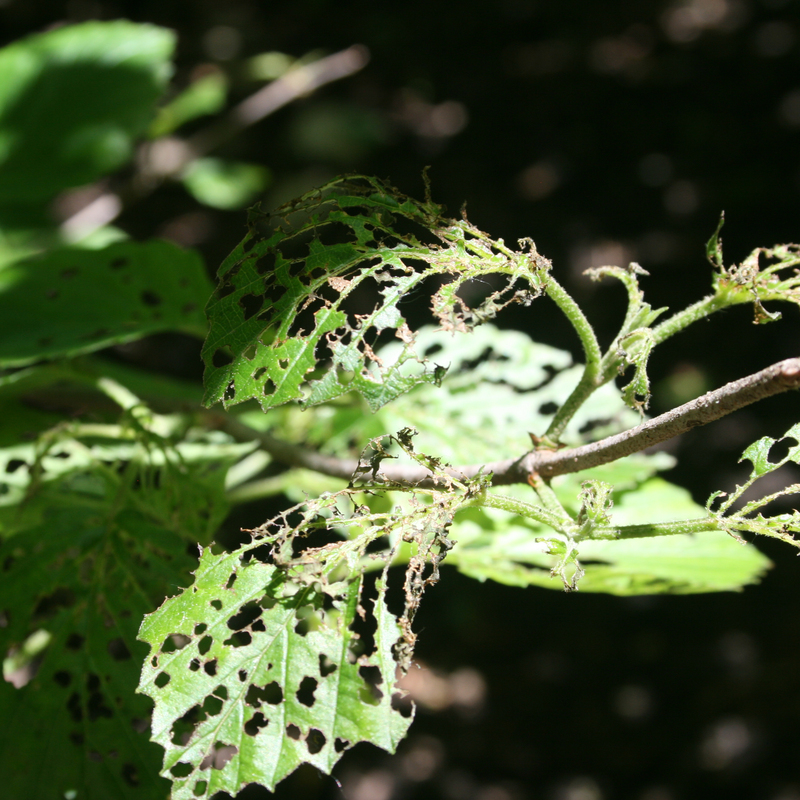 Most of the damaged leaves had at least one of the larva on it. I pruned all of the branches that I found with larva on the leaves and threw in the trash, hoping that it does some good. I also checked my neighbors plants, Arrowwood and American Cranberrybush, which also had damage. Just letting you know they’re here.